Anoat was one of three habitable planets in the Anoat system of the Anoat Sector, located in the Greater Javin of the Outer Rim. It was located between the Hoth system and the Bespin system. 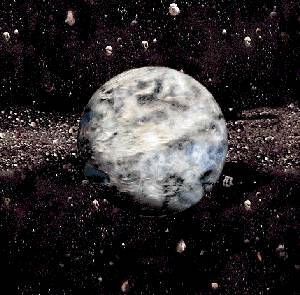 The planet, while habitable, was generally inhospitable, like the other worlds of the Anoat system. The planet's fauna included Anoat lizard-ants. Some time before the Battle of Yavin, Anoat served as a colony world for the pig-like Ugnaughts. By the time of the Galactic Civil War, the planet's only settlement, Anoat City, had long been vacated as toxic waste infected Anoat. Imperial weapons designer Moff Rebus, who worked on the Dark Trooper Project, chose this unpleasant planet as a hideout. Rebel mercenary Kyle Katarn extracted Rebus from his hideout in the sewers of Anoat City. Following the Battle of Hoth, the Millennium Falcon passed through the Anoat system while running from the Imperial Navy. Later, aliens repopulated Anoat and it became part of the New Republic, in which it was represented in the New Republic Senate.